File - lets you save and load Presentations and log out of XSplit Broadcaster. Presentations contain the configurations for Scenes, such as what Sources each Scene contains. View - provides you with a way to access the Preview Editor, Projector, and scale XSplit Broadcaster’s window to match your selected resolution. Help - gives you access to the manual and release notes, lets you send feedback, redeem gift certificates, upgrade/extend your license, check for updates, and see what version of XSplit you have installed (in Help -> About). 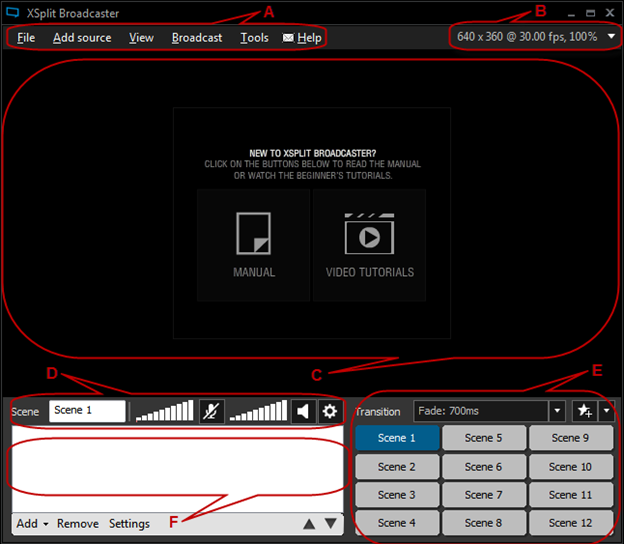 The Resolution and FPS area lets you set your desired broadcast resolution and frame rate. The first box lets you set the name of your scene. Next, the Volume Mixer allows you to you adjust the audio for your microphone and system sound. The system sound is what comes through your default playback device (Control Panel > Sound > Playback > Default Device), which is usually your gameplay audio. Finally, clicking on the gear icon opens the advanced audio settings, where you can choose the source of your system sound, microphone, etc. This is the Scenes control panel. A scene is actually a combination of Sources. You can switch to a different scene by clicking on its button. You can also choose the scene transition (e.g. Fade, Fan, etc.) you want to use and how long you want it to be. When you hover over a scene, you get an active preview of that scene in the bottom right corner of the viewport.We recommend you use a variety of scenes to improve the presentation of your broadcast. The Sources list lets you add or remove sources and arrange what layer each source is on. You can also select a source and access its settings here.